Nearly 30 million battle diabetes. Every 23 seconds, someone is diagnosed with diabetes, and diabetes causes more deaths a year than breast cancer and AIDS combined. But with your support today, we can continue to fight back. Just 30¢ a day provides the American Diabetes Association with consistent funding that can go directly to finding a cure and help more people with diabetes live healthier lives. 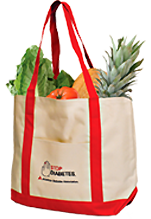 Get Your Free Stop Diabetes® Tote Bag! This handy, colorful tote bag is yours free when you give a monthly donation of $9 or more. Create a living memorial in the name of a beloved family member or friend. Your tax-deductible donation will fund critical diabetes research, education and awareness programs that will improve the lives of those with diabetes. Your gift includes the choice of an email or print card sent to the family. Making an honor donation to the American Diabetes Association in the name of a loved one is a meaningful gift for any special occasion. Join us now in commemorating our 75th anniversary by making a gift today. Your tax-deductible gift will fund critical diabetes research, education and awareness programs that will improve the lives of those with diabetes. 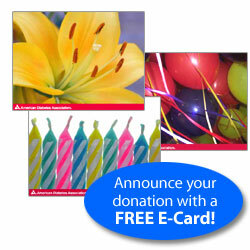 Your gift includes the choice of an email or print announcement card for your gift recipient. Help Cure Diabetes. Give a Gift Today! Use our Memorial Donation Form or Honor Donation Form to make a donation to honor someone you love or remember someone you've lost.